As the brand name may suggest, Snowpeak titanium is a company that is heavily geared toward backpacking products. According to their words, Snowpeak is the originator and developer to perfection of lightweight, titanium cookware. Their lines of titanium backpacking cookware different single and two person cookware sets, with the most popular being the 3pcs set. They have also launched an original camping cookware sets, a hybrid concept between traditional and outdoor kitchen utensils. The company tradition goes back in time as long as 1958. This was the year when accomplished mountaineer Yukio Yamai, not being satisfied by the available backpacking products, decided to create its own line of outdoor products and accessories. There are two core concepts that made Snowpeak titanium company very successful in outdoor and camping sector. The first one is the seemingly no-brainer key idea that products should work according to what the user expects. By extending the Murphy’s law regarding to computers that asserts that computers do not do what you want them to do, but rather what you tell them to do, you may get the general idea that commonly the products usually perform based in the way they were designed to, and not in the way the end user expect to. The solution found by Yukio Yamai, which is the second concept that makes the foundation of the company success, was field-testing the products and redesigning them accordingly, before they were actually produced and marketed, in a process that was nicknamed “hypothesis and verification”. Snowpeak titanium experience began as soon as the metal was available for commercial applications. Although initially the company concentrated on the specialty climbing products, such as bolts, nuts, carabineers, ascenders, quick draws, once the company was taken over by In 1986, Tohru Yamai, the founder son, the company began aggressively promoting the development of general camping gear. The greatest Snowpeak titanium use is not in cookware, although the company line of titanium backpacking cookware is extensive, but in what cookware is designed for. I mean, for backpacking stoves. It is the titanium stoves that acquired the critically acclaimed success and recognition of Snowpeak and made it stand out from the multitude of backpacking equipment producers. As a leader in outdoor innovations, there are some special products that are only produced by Snowpeak, to reinforce its dominating position on a market. The Snow Peak Carry-on Chopsticks reinforce the company commitment to tradition and pays a special homage to the company Japanese inheritance. 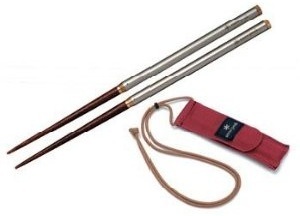 Collapsed, the Carry-on Chopsticks are only 4.5 inches in length. Using the Snow Peak Carry-on Chopsticks eliminates the need for disposable chopsticks, and Snow Peak makes the tips out of recycled baseball bats, so they're not only handy, but environmentally friendly. Snow Peak even included a carrying case with a lanyard, so you won't lose these in the recesses of your pack. The “Caucasian” alternative, is obviously the popular titanium spork which is also produced by Snowpeak. The SNOW PEAK Giga Titanium compact stove was launched some seven years ago and it was claimed to be the lightest stove in the world. It’s still ultra light, but there are a few stoves that weigh even less, including Snow Peak’s own Lite Max at an amazing 54 grams. For most backpackers, I imagine 74 grams is light enough. The Giga stove is shorter than most cartridge top stoves and has a tiny burner head. The flames come out of the side of this burner however so it doesn’t mean the flame spread is narrow. There are four pot supports that fold inwards and a long flame control lever that also folds in, so the stove packs very small. The Giga Titanium is beautifully engineered and has proved very durable, which somewhat justifies the high price. There is a stainless steel and aluminum version that weighs 106 grams. There are also versions with piezo igniters of both the titanium and steel versions that weigh and cost a little more. Given the general experience with such igniters, the extra cost or weight is hardly justified.